Sathya Sai Baba has declared that He will usher in a new era of Love, Peace, Righteousness, and Truth. This “Golden Age,” as He calls it, is destined to begin soon with an event (or series of events) that will draw world attention to His Divinity. 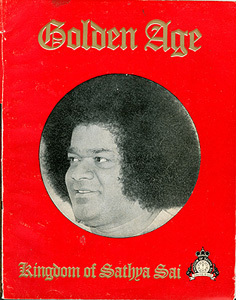 Sai Baba has several times jumped the gun and heralded in “The Golden Age” of mankind. He supposes himself to be the precursor of such an age, and – as often documented – it will begin by his reforming India completely first, then the rest of the world. Sai Baba has told people on occasion that a great shift in human consciousness will come – he did so before the millennium (but nothing happened, not even the millennium bug – thereafter Twin Towers and the war on terror began). Connie: Then what about the Golden Age (of Peace and Plenty which will last for a thousand years) – when will that actually be here? Baba (Predictably, heh-heh): The Golden Age must begin in each person’s heart. Then only can we have peace on earth. Each must start now to make the Golden Age in his heart. Connie: But Swami, we’re all doing the best we can in that (department) now. I mean when will (all of) humanity agree “This is the Golden Age – here, now…? Sai Baba’s boast to Dr. John Hislop that India is the locomotive that will pull the world to rights due to its spiritual and moral superiority has, of course, most dismally failed to appear. That his students would occupy positions of power long since and thus change society has also proved to be sonorously hollow words. This entry was posted on November 21, 2010 at 10:49 am	and is filed under Cults, Gurus, India, Propaganda, prophecy, Sathya Sai Baba, Spiritual propaganda. Tagged: Golden Age of Sai. You can follow any responses to this entry through the RSS 2.0 feed. You can skip to the end and leave a response. Pinging is currently not allowed.